Hot on the heels of Andy Halliday’s impending exit from Rangers (albeit we do not know if it will be Dundee or Azerbaijan yet) is the continuing story of Barrie McKay. Having famously rejected the initial contract extension offered him earlier this year, the 22-year old winger has reportedly asked to speak to other clubs, and as a result, Rangers have ditched him to train with the U20s. 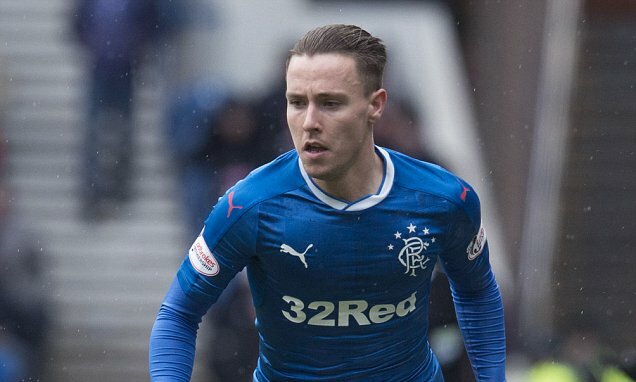 In short, Barrie McKay will leave Rangers if the right offer comes in, and is extremely unlikely to play again for this club. The winger has had a controversial time of it over the past 12 months – after initially being the toast of Ibrox following a fine season in the Championship, he has mostly struggled to reproduce that level in the SPL, with some heavy criticism headed his way from most quarters of the Rangers support. Indeed, one decent piece of management from his former coach Warburton was to drop him during a spell of dire form around October. By the time he was reinstated he had finally started to produce something akin to what was expected of him. Sadly it tailed off soon after and by and large the attacker has been pretty poor of late. His head went down further though under Pedro Caixinha. Put simply the Scotland cap never looked happy under the Portuguese, rarely producing any effort under his management never mind performances and going by the fanbase’s response to the latest story of his being dropped to the youth levels, supporters have run out of patience with him. With a contract rejection still fresh in the mind, plus reports that on top of his asking to speak to other clubs Forest are also substantially interested in acquiring his services, McKay’s time at Ibrox appears to be coming to a bit of an underwhelming end. He was noticeably not at Monday’s Ibrox training session with the senior squad, so unless there is another unexpected reason for his absence, the reports of him with the U20s now are probably true. Ibrox Noise seems to have got him wrong – we truly believed this kid was the future of the club, and would take to the SPL like a duck to water, but this was miles off the case – whether under Warburton, Murty or Caixinha, McKay just has not done it for Rangers in Scotland’s top tier, and now that he has been completely axed from first-team training it appears it is only a matter of time before he leaves. This is becoming a witch hunt against McKay. At the end of the day all our players were shi*e last year with exception to Miller, Hill and Foderingham. It doesn't make them all bad players. Were they badly coached, i beleive they were as warburton didnt improve many players over his stint as boss. Lets use the example of Celtic. Ronny Deila failed as their coach , he couldnt get the players playing for him and it showed. Fast forward one year and Brendan has got the players Deila couldnt coach playing well and improving. Armstrong under Brendan has been a revelation this year. Last year bench warmer this year 1st pick and in the scotland squad. It is now time for Pedro to show he can coach. Can he improve McKay, Windass, Dodoo,bates, beerman etc. That is what he is there to do, improve our team. McKay has got something about him, in a better team with players able to lighten the load he could prosper. It isnt fair to put the boy down because we expected alot from him, it is a learning experience and i think it is short sighted and lazy not to try and develop him. We can not stop him moving on it is up to him i just thought he would be one with top wages just shows if the manager sees you as not worth it then you are gone,good luck to him. It would be a huge shame to see him go. Of that there is no doubt, but if he has an attitude problem, then Bye Bye mate. I like Pedro so far BUT I have always thought it wrong that a manager can waltz in and make sweeping changes that can set a club back years if they f off 6 months later for a better offer if/when it all goes wrong. If it works then great as only 11 players play BUT if it doesn't then so much damage can be done i.e these players spending years in youth development and being tossed aside too easily because of a personality clash or whatever. You won't get that talent back on the cheap...It's gone for good. I'm looking forward to the new season but there is quite clearly bad feeling and unrest and worrying that the new guys won't potentially kick on. If they don't and Pedro goes then we will be back to a Championship level of a team. 5-0 to the Gers on Thursday! The potential is still there, but if a coach doesn't like you, then you dig in or pout. He did the latter. I won't miss him. It's a shame because has good skills while i agree with some of the other comments that he's soft and his final ball is poor that can be worked on with the coaches,i just get the feeling that he wants to go,but put a high price tag on him and if we get it fine if we don't then he can rot away in the reserves for a year and we will see how he likes that. Bad decision letting Barry leave, he has shown his quality. What he needs is mentality development. Heard he's a quiet and introvert lad which can effect performances on the pitch if not left in the dressing room. I say keep him and get him some personality coaching. Its a shame as he's one of our own but he simply is not good enough. He looked like he couldn't be bothered most of last season. If he goes to Forest he's going to a very, very competitive division, its often down to the last few games before a title winner is clear, not sure he has the strength of character for that either. At Ibrox the jersey is just to heavy for him. Best of and lot of good and fair comments. He doesn't look like he can be bothered. But as Pedro Caixinha said many times. We need players who want to be at Ibrox. Sentiments and loyalty to half hearted players cost John Greig mbe and Ally McCoIst thier jobs because the players let them down. Barrie Mackay has rare talent. I agree his performance fell away last year, but if Walter Smith were manager he would know how to get the best out of him - and his best is very good indeed. A worrying indication of poor man management skills by Pedro Caixinha to give up on him. Why don't we try a straight swop with Hearts Jamie Walker for Rangers Barry McKay. Has potential but so had many of my classmates, consistency and determination wasn't there and that is everything for a Rangers player. Might get one more chance at another club but a leopard can't change its spots. I am not sure what happened to football there are hundreds of free players looking for clubs and any team nowadays only need the wages and they could have a team full of frees it is the way for other Scottish clubs to go. No passion,too much disinterest,seems to care more about his appearance than playing football. Quite simply, not good enough to wear a Rangers jersey. Won't be sorry to see him go. Waghorn should follow him. IF we cud get £2m for him then u buy walker n Maclean 2 players for the price of one. Ano people will say if we get them signed up in a pre contract blah blah, if caixinha wants them now then this is the way to do it ,it's not really cost us wen u look at it like that. Can't believe the negativity towards McKay from some Rangers supporters. Sure McKay had a poor season overall - but who didn't apart from Miller & Hill. McKay gets slaughtered for a poor performance in a poor team while excuses are made for poor results under Caixhina because he inherited poor players. Fact is McKay performed better against Celtic (first old firm game at Ibrox) than Caixhina did in his two attempts. For me Caixhina's man management skills are poor, and I worry that he will have his favourites and create division in the dressing room. He should recognise wee Barry is a talent - put an arm around him and work out how to get the best out of him. This is one we'll regret in the not too distant future.